The slogan of this year's Komikazen comics festival was “99%”, which is the phrase that is actually originating from Occupy movement. It directly refers to the concentration of income and wealth among the top earning 1% of world's population, and reflects a belief that the rest "99%" are paying the price for the mistakes of a tiny minority within the upper class. Komikazen is a “festival il fumetto di realta” - which means that it is promoting comics that ciritically refer to the different aspects of social and political realities all over the world, quite often triggering the human rights violation issues, inter-cultural influences and dialogues, etc. Opening evening of the festival brought up two interesting exhibitions/presentations. First one took place in TAMO gallery of mosaics, where organisers presented the new book by Elettra Stamboulis and Gianluca Costantini, entitled “L'ammaestratore di Istanbul” /”The tamer of Istanbul”/. 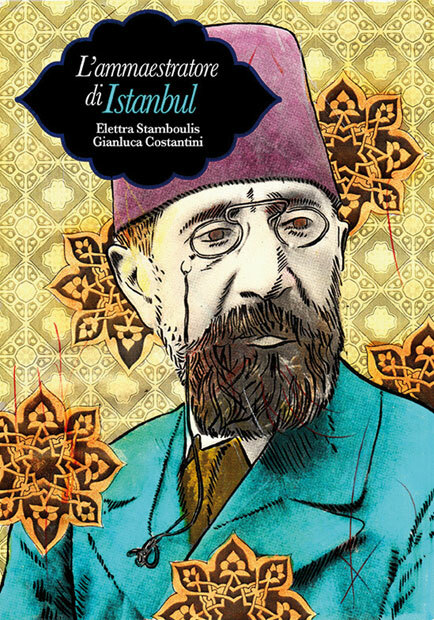 In fact, it is a graphic novel about Osman Hamdi, Turkish archaeologist and painter, famous to be the first painter who started the practice of realistic representation of female portraits in Turkish tradition of visual arts. Book was published under the umbrella of project GIUDA /Geographical Institute of Unconventional Drawing Arts/, that is publishing important graphic art that is usually ignored by mainstream and commercial publishers. Later in the same evening, at the MIRADA gallery in the center of town, we attended the presentation of the comic book about German left-wing peace activist Alex Langer, who was campaining for the peaceful mediadtion of conflict in Bosnia during the 1990's ethnic wars. 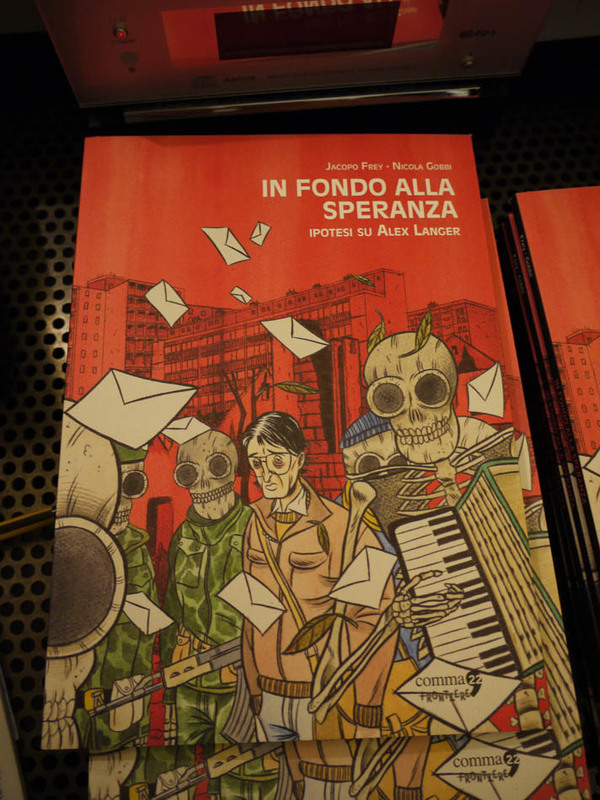 The book entitled “In fondo alla speranza – ipotesi di Alex Langer” has been written and illustrated by two young authors, Jacopo Frey and Nicola Gobbi, winners of the contest “Reality Draws”, through which the publication was made possible. Having on mind similar editorial policies in previous years, we concluded that Komikazen is “a place to be” for promoting such project as Risha online magazine, and the organisers of festival were more than happy to have us there. The main event of the festival, performance entitled “99%” was taking place at MAR – Museo d'Arte della citta di Ravenna, which is a museum of modern arts. For this occasion, organisers have prepared 99 exhibition frames, and invited 99 authors to create a one-page comic each, which shall somehow, directly or indirectly, refer to the topic of “99%”. Exactly at 18h on 12th of October, gates of the museum have opened, the happy crowd of artists has rushed in and each author has set up his own artwork in a frame and hang it on the wall. To be honest, that was the fastest exhibition set-up ever seen in humble curatorial carreer of Risha team. The whole event was directly streamed on the internet, and here you can see the recording. At the entrance of the space where the performance and exhibition took place, we got a room for the Risha presentation, which turned out to be very well accepted by the international audience. Colourful mixture of styles, attitudes and approaches that is main characteristic of our Risha Project, was seen as refreshing touch to the whole festival atmosphere, especially having on mind that the main rule of “99%” performance was that all the comics produced for it had to be done in black and white technique. We exposed the artworks of our contributors, that you can find in the Comics section of Risha website. To check out the photo gallery report, click HERE. Komikazen festival was invented and organized by the Italian association Mirada, and curated by Elettra Stamboulis and Gianluca Costantini. Besides Komikazen, town of Ravenna is famous for its mosaic art tradition and collections that are dating since early Christian/Byzantine period, as well for its history of leftist movements and activism through whole 20th century. Somehow, these two aspects of town's history are perfectly blending through such form as innovative comics platform called Komikazen. Till next year, stay well dear Komikazen!